This unusual and interesting surname is of early medieval English origin, and is a metonymic occupational name for a maker or seller of goblets. The derivation is from the Old French "hanapier", Anglo-French "hanaper", a drinking-vessel, wine-cup, goblet. A quotation from the "Promptorium Parvulorum", a medieval dictionary, reads: "Hanypere or hamper, canistrum". Job descriptive surnames originally denoted the actual occupation of the namebearer, and later became hereditary. One John Hanaper was recorded in the 1273 Hundred Rolls of Huntingdonshire, and a William Henyper was noted in records of Somerset, dated 1327. Walter Hampermaker appears in the Issue Roll of London, dated circa 1400. 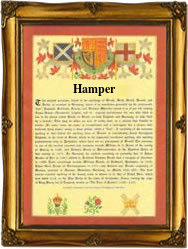 By the late medieval period the word "hanaper, hamper", had acquired the meaning of wicker case, small basket, usually one in which documents were kept, and some examples of the surname may be occupational for a maker of these baskets. On January 28th 1539, Robert Hamper and Helinor Porter were married at St. Lawrence Pountney, London. The first recorded spelling of the family name is shown to be that of John le Hanaper, which was dated 1236, in the "Early Charters of the Cathedral of Church of St. Paul's", London, during the reign of King Henry 111, known as "The Frenchman", 1216 - 1272. Surnames became necessary when governments introduced personal taxation. In England this was known as Poll Tax. Throughout the centuries, surnames in every country have continued to "develop" often leading to astonishing variants of the original spelling.